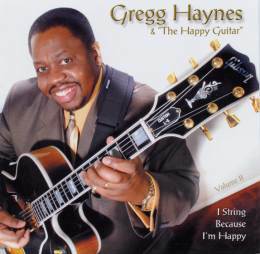 With a catchy title like I String Because I'm Happy, guitarist Gregg Haynes pulls you inside his 19-track album of instrumental renditions of some of Gospel's most requested numbers, along with several originals. The St. Louis native excels at bringing life to tunes that some would consider so familiar that they cower from touching them, perhaps for fear of not doing them justice, or maybe simply to avoid getting lost in the presence of strong music. But Haynes' artistry is so strong that his imprint is never lost, even in the midst of the most familiar of melodies. "Love Said Not So" is a case in point. The Bebe & CeCe song is powerful all over again under Haynes' watch, and you always know that this is not a replica of the original. 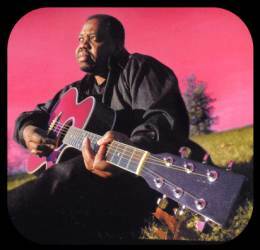 Haynes uses a variety of instruments, from the electric to the acoustic and beyond, the diversity of sounds is abundant. On Fred Hammond's "Dance Like David", the emphasis on hard-edged electric, and on Kirk Franklin's "Melodies From Heaven", the vibe is all jazz. Haynes' originals are impressive too. "Happy Stringin'" is a standout, making use of steel guitar and a rollicking, rhythmic and joyous arrangement that shouts out good news even without lyrics. Several segments of popular choruses are embedded into the cut. Look for "Goin' Up Yonder", "I'm A Soldier" and "On Time God" to bring a smile to your face, not to mention the redos of hymns such as "Holy, Holy, Holy" and Dorothy Love Coates' "You Brought Me". Put this project on your must-have list, because Gregg Haynes is the one.